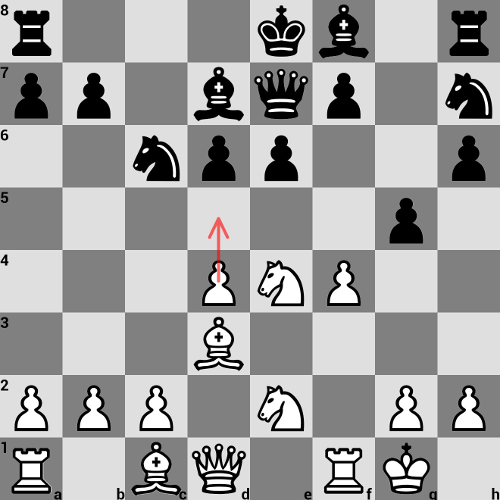 Why is d5 the best move in this position? What is the thought process behind playing d5 in this position? I'm not sure if it's the best one but... First of all, it breaks black's pawn structure. Look at black pieces: Bf8, Nh7, rooks haven't moved, King is in the center. If you have safe king, developed pieces and your oponent is miles behind you, you want to open files. d5 is a move that I would do without much thinking. Such move just must be good! After 1. ... - exd5 2. N4c3 and pawn on d5 falls. Be6 doesn't work due to simple f5. This position is much much better for White. Look at this structure. Pawn on d6, black pieces. Argh, I don't like it soo much from black's perspective. And keep in mind, pawn on g5 is hanging because of 1. Bh7 - Rh7 2. fg5 - hg5 3. Bg5. user3447603 has already given a nice answer, so I'll just add something orthogonal to his: Bear in mind that d5 comes with a double attack, c6 and e6, so black's ideal response of e5 is not allowed anymore (to try and keep e-file blocked). So either he takes it and destroys his center and gives up the e-file, or he moves the knight and allows black to take on e6 (not the best move but still) and play around the weakened central pawns (also f5 coming in some variations). Finally this position demands for crude forcing moves, simply because practically speaking you don't want to give black the opportunity to long castle and secure his king. On a last note, all things said, one shouldn't get carried away here and wrongly assume that any crude and aggressive attack is going to work out, after all no matter how advantageous your position, you need to calculate things. White is better developed so he wants to 1) open the position and 2) "chase" the knight on c6 (Black's best placed piece). d5 Na5 2. d5xe6 f7xe6 3. N d4, and White's two center knights have a great attack against Black's two "hanging" center pawns. This result was made possible by the fact that d5 forced Na5. If black takes the pawn on d5, he will lose control over d5 and f5, which are key squares in Sicilian-type positions. The d-file opens, which makes the d6 pawn weak. Taking on d5 is positional suicide; as such, the lesser evil is for black to move his knight, which loses control over the d5 square, so white could play Nd4 himself at some point and exert pressure on e6 and possibly jump into f5. From a tactical perspective, the e-file opens, which makes the black king rather airy. Notice how black's pieces are rather poorly placed, and it looks like black is trying to carry out flank operations (while his king is uncastled). General principles suggest that white should strike in and open up the center in response to this. Not the answer you're looking for? Browse other questions tagged analysis strategy pawns or ask your own question. What's the best plan for white in this position? Why isn't there a big advantage in this position for black? What is Black's best move in this position? Why is Kh8 the best move in this position for black? How to continue in this game? Why is `a5` a better move in this position? Why does ChessMaster recommend 24. Rg3 in this position? What is the thought process of a GM playing bullet?